On average, workers who stand all day exert 20% more energy compared to those who sit down, therefore becoming fitter than those who sit. According to the Office for National Statistics (ONS), an average of 131 million days are lost to sickness absence every year. 24% of these are due to back, leg or foot pain – the biggest cause of staff absences even over coughs, colds, stress, anxiety and depression! Now that’s a big number. A study from Loughborough University found that it takes just 90 minutes for fatigue to set in and only 50 minutes for concentration to decrease because of it. Some jobs are naturally more active and will require workers to stand for long periods of time. Whilst this may be unavoidable, there are a number of things that employers can do to help protect the health and wellbeing of their staff. Which is a legal responsibility. As the name would suggest, anti-fatigue mats are designed to reduce fatigue caused by standing for long periods of time on a hard surface. They can help staff to feel more comfortable as well as increase concentration and efficiency whilst of course providing additional safety in the workplace. Quite simply, our bodies are not designed to stand for long periods of time which is why workers who are on their feet all day are usually a lot more tired than others. 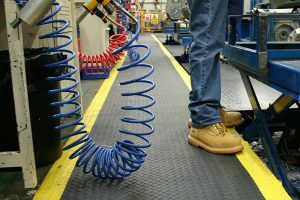 Anti-fatigue mats can help to improve staff productivity in a number of ways. They improve concentration, insulate against cold floors and reduce energy use by relieving tension and supporting the muscles which are being used. Anti-fatigue mats are made up of small cushioned air domes which help to stimulate cyclic muscle contractions. This encourages foot and body movement, promotes posture changes and stimulates blood circulation. They also make natural, frequent and minor changes to your standing position which helps to prevent joint stiffness. Furthermore, they reduce headaches by easing tension in the neck and shoulders. 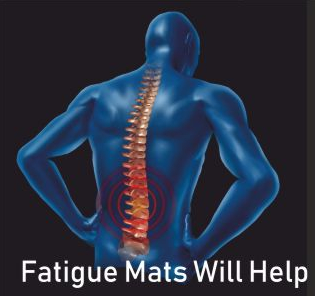 Back pain is a common complaint amongst workers who are on their feet all day and anti-fatigue mats can really help to prevent this from happening in the first place as well as relieve existing symptoms. They do this by relieving pressure on the spine and reducing the strain on the muscles in the back. Anti-fatigue mats absorb the shock due caused by walking. This cushioning effect reduces foot pressure, fatigue and the likelihood of injuries occurring. Their textured or ribbed surface also helps to prevent slips which means that as an employer, you are less likely to have a claim made against you. Please feel free to browse our range of anti-fatigue mats as well as non slip and swarf mats at https://www.tradeshopdirect.co.uk/workplace-matting or contact Andrew on 01353 665141 for more in-depth information.